The Red Sox made another addition to their rotation by signing right-hander Justin Masterson to a one-year contract. Masterson will earn a $9.5MM base salary, plus he can earn another $2.5MM in total incentives by reaching certain innings thresholds. He’ll earn another $500K if he hits 185 innings, and then another $500K for every five innings after that, up to 205 innings. 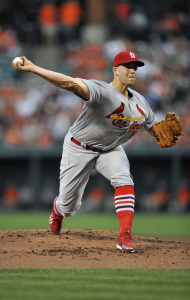 Masterson, 29, fell off significantly last year after a three-year run in which he averaged 205 frames and a 3.86 ERA (that included outstanding campaigns in 2011 and 2013 sandwiched around a dud in 2012). In 2014, he scuffled to a 5.88 ERA in 128 2/3 innings last year, striking out 8.1 and walking 4.8 batters per nine while dealing with a variety of shoulder, knee, and back issues. Masterson lost nearly three ticks on his average fastball velocity last year, though he managed to carry a typically stellar 58.2% groundball rate. In the aggregate, Masterson presents a classic buy-low opportunity after entering 2014 as a significant extension candidate or future free agent target. He will look to regain his form with the organization that drafted and developed him. ESPN.com’s Buster Olney was the first to report an agreement between Masterson and the Red Sox. WEEI.com’s Rob Bradford reported the contract length and value while Ken Rosenthal of FOX Sports had the breakdown of Masterson’s incentives.